The "Dedicate The Dream" button relates to the dedication of the Martin Luther King Jr. Memorial which was held on October 16, 2011 in Washington. The dedication was originally planned for August 28, 2011 as indicated on this button. The August dedication was cancelled due to weather concerns stemming from Hurricane Irene. Two other dedication related buttons and additional background appear elsewhere on this site. The March on Frederick was held on September 26, 2014. Over 1000 people marched from Harry Grove Stadium in Frederick, Maryland to Hood College, where they heard the noted Civil Rights activist, Julian Bond, speak. The march was a tribute to the historic 1963 Civil Rights March on Washington, as well as a celebration of the passage of the 1964 Civil Rights Act. The march passed historic sites along the route noting the progress made within the Frederick community since the passage of the Act. The title of the event, sponsored by Hood College, was, "Realizing The Dream." The Rosa Parks Museum is located on the Montgomery, Alabama campus of Troy University. The museum was opened in 2000 and has as its primary purpose the interpretation of materials and history relating to the 1955-1956 Montgomery Bus Boycott. The boycott began when Rosa Parks (1913-2005), an African-American woman, was arrested for not giving up her bus seat to a white person on December 1, 1955. Rosa Parks is described in more detail elsewhere on this website. The Rosa Parks Museum button reads, "Women who behave rarely make history." This quote was first used in a 1976 academic journal written by historian Laurel Thatcher Ulrich. The Baltimore based Afro-American Newspaper was founded in 1892 by John Henry Murphy Sr., a former slave. It is the oldest African-American family-owned newspaper in the nation. In 1922 Carl Murphy, the founder's son, took over as the editor and served in that capacity for 45 years. The newspaper grew and at one time published various editions in over a dozen major cities across the country. Today, the Afro-American publishes two editions weekly, one in Baltimore and the other in Washington. The button depicted here was issued in honor of the 100th Anniversary of the newspaper, which is also popularly known as "The Afro". Along with its coverage of news and current events, the Afro-American newspaper remains a strong advocate of equal rights, and economic opportunity. The George Washington Carver Museum and Cultural Center, located in Austin, Texas, is a National Register of Historic Places property. It is named for George Washington Carver (1864-1943), the famous agricultural chemist and inventor. Founded in 1926, this museum is the first African-American neighborhood museum in the state of Texas and seeks to preserve, document, and exhibit materials pertaining to African-American history on the local, state, national, and international levels. The gold George Washington Carver Ambassador lapel pin portrayed here is given to museum members and supporters. 50 Years Forward is the 2013 theme commemorating the 50th Anniversary of the Civil Rights movement in the City of Birmingham, Alabama. Among the events of 1963 being recalled through numerous year-long exhibits and forums are the 16th Street Baptist Church bombing which took the lives of four little girls, Martin Luther King's letter from the Birmingham Jail, lunch counter attempts for service, the violent response characterized by fire hoses and police dogs by police officials to peaceful protesters, the Children's Crusade, and integration of the Birmingham schools. "Fear of a Black Republican" is a documentary directed by Kevin Williams that was produced in 2011. It examines why there are so few African-Americans in the Republican Party and how this impacts the nation's political process, specifically, the lack of a two-party system in the nation's urban areas. Numerous scholars and politicians are interviewed in the 111-minute film. This button was distributed at the Conservative Political Action Committee (CPAC) Conference held in National Harbor, Maryland, March 6-8, 2014. The Center for American Racial Equality (CARE) is a national grassroots organization. It feels that in many ways the economic, educational, and civic opportunities for African-Americans have been neglected to some extent by the policies of both political parties. CARE believes that "a respectful dialogue" undertaken by all parties will advance "the cause of freedom and equality" for everyone. This button was distributed by CARE at the Conservative Political Action Committee (CPAC) Conference held in National Harbor, Maryland, March 6-8, 2014. Isaac Scott Hathaway (1872-1967) was an African-American sculptor, artist, and educator. Born in Lexington, Kentucky he designed the first two U.S. coins to honor African-Americans, these being Booker T. Washington (1946) and a second coin in 1950 depicting both Washington and George Washington Carver. These coins were commissioned by the Fine Arts Commission of the United States Mint. Hathaway achieved fame in not only creating busts of historic African-Americans (such as Frederick Douglas, W.E.B. DuBois and Paul Dunbar), but also in his discovery of various clays. He taught at the University of Arkansas, Tuskegee University and Alabama State College where he retired in 1963. In 2012-2013 students from the Auburn University (Alabama) Appalachian Teaching Project focused their research on Hathaway in an effort to increase public knowledge of Hathaway's importance, not only to black history, but to art. The results of this effort was shared with the Tuskegee Human and Civil Rights Multicultural Center in Macon County, Alabama. The buttons portrayed here depict both of Hathaway's above referenced commemorative coins. They were distributed in Washington DC during a project presentation by the Auburn students at the annual Appalachian Teaching Project conference held on November 30, 2012. GirlTrek is a national non-profit health-related organization that was founded two years ago and is based in Washington DC. Its purpose is to inspire and support African-American women and girls to live healthy lives. Following in the tradition of Harriet Tubman and the historic civil rights marches, GirlTrek emphasizes "walking", and works to fight diabetes, obesity, heart disease, and stroke by encouraging good food choices and exercise. There is currently a nationwide grassroots network of over 15,000 GirlTrek walkers across 39 states with over 145,000 supporters. On March 10, 2013 GirlTrek honored Harriet Tubman with a "We Are Harriet" tribute featuring GirlTrek walks across the nation. 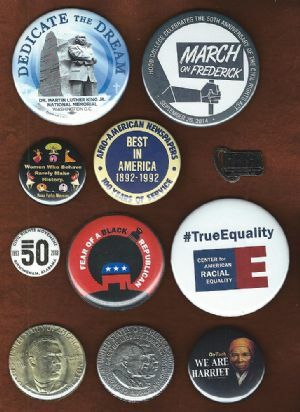 The button displayed here, which features artwork by Janice Huse, was distributed at the Harriet Tubman Walk on the National Mall on that date.